I’m mildly addicted to salty duck eggs (xián dàn 咸蛋), which is good because they’re on the menu pretty frequently here in Hong Kong. Salting gives the yolks a wonderful grainy texture, which sounds odd but tastes delicious, and the whites are full of (salty) goodness too. Once you’ve dealt with that black stuff (earth? charcoal? 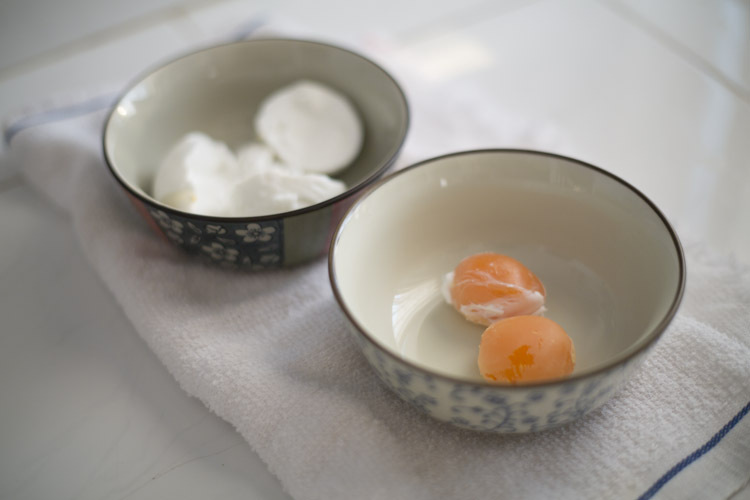 ), the uncooked texture of the egg inside is pretty odd too – the white is watery in some places, solid in others, and the gooey yolk emerges looking semi-cooked already. Assuming you can find them in the shops (Asian stores clearly being the first port of call), don’t let any of that put you off. Hard-boiled salty duck eggs behave perfectly normally, and can be used to add flavour and texture to a variety of dishes. 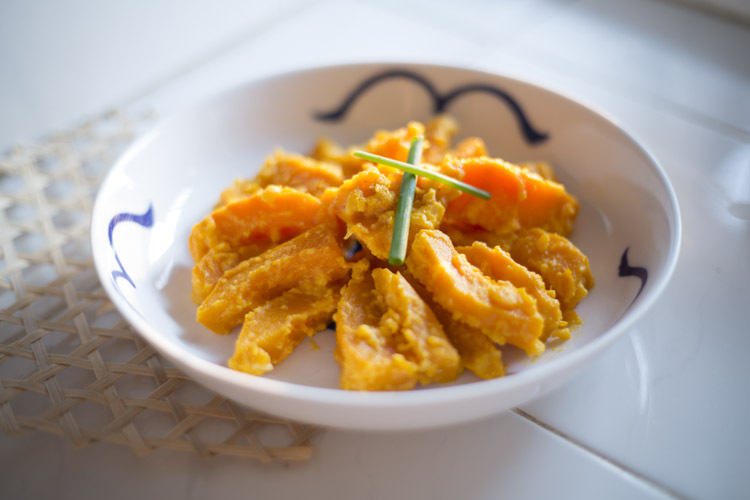 Here, in one of my favourite Cantonese dishes, they’re used to coat bite-sized pieces of pumpkin in a super-simple two ingredient dish that looks much more complicated than it is. The very best kind of cooking! 1. Boil the salty duck eggs for 10 minutes. 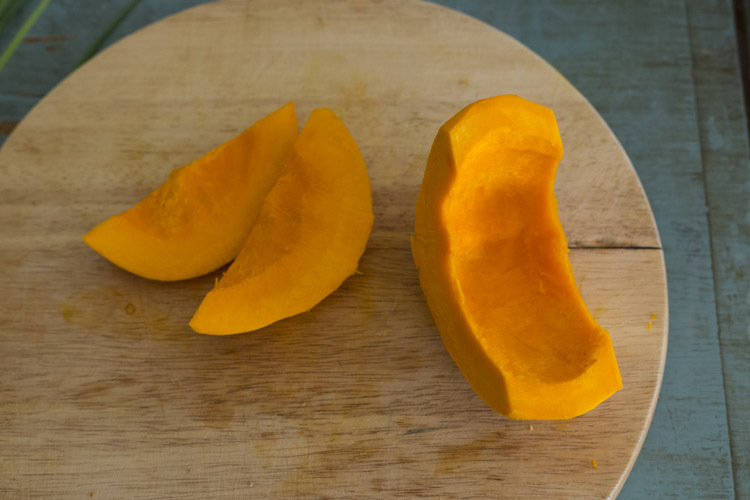 Peel and chop up the pumpkin while you’re waiting for the eggs to cook. I topped and tailed my very small, very orange pumpkin, then cut the middle section into batons about 1.5cm thick. 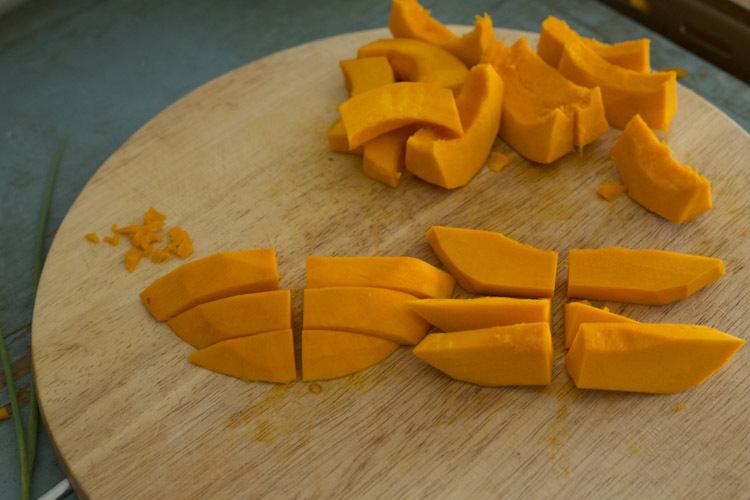 I sliced the top and bottom into similar sized pieces – aim for something that can be eaten in two bites. 2. Drain the eggs and put them in a bowl of cold water. Boil another saucepan of water (in case any of that black stuff got into the water) and blanch the pumpkin for 4-5 minutes. The pieces should be cooked through, but still be able to hold their shape. Peel the boiled eggs and remove the yolks while you wait for the pumpkin to cook. 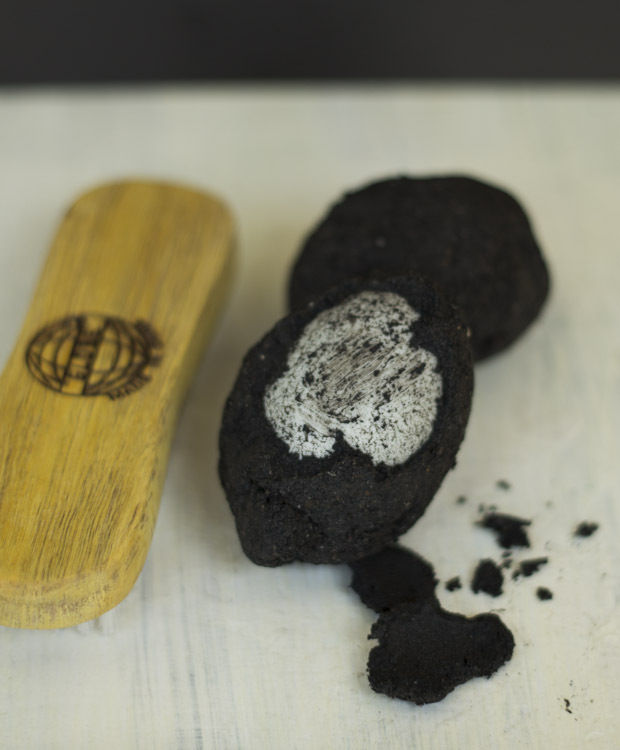 The salting process does something weird to the membrane of the egg, making them a pain to peel – it’s just as well they don’t need to look nice for this dish. 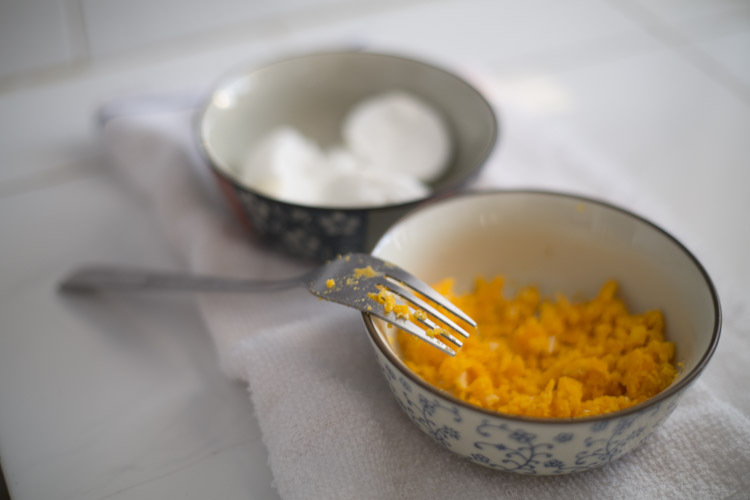 Set the whites aside and mash the yolks with a fork. 3. Drain the pumpkin and heat a few tablespoons of oil in a wok. 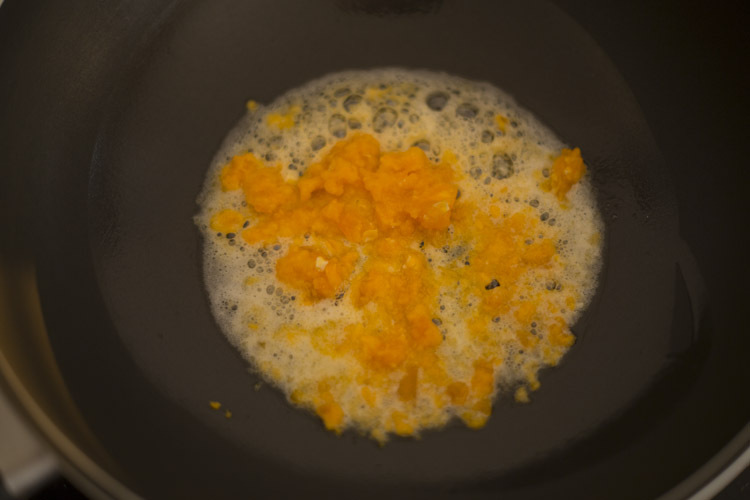 Fry the egg yolk, mashing it with a wooden spoon until any large lumps have broken down and it foams (!) then add two tablespoons of water and stir quickly to make sure the egg doesn’t stick. 4. Throw in the pumpkin and keep stirring until all the pumpkin is covered in a layer of egg yolk and there’s no liquid left in the bottom of the wok. Arrange on a plate, sprinkle with salt and pepper and serve immediately. The leftover salty egg whites can be added to rice porridge (a.k.a. congee or zhōu 粥), or added to fried rice, though do be aware that the whites are much saltier than the yolks. 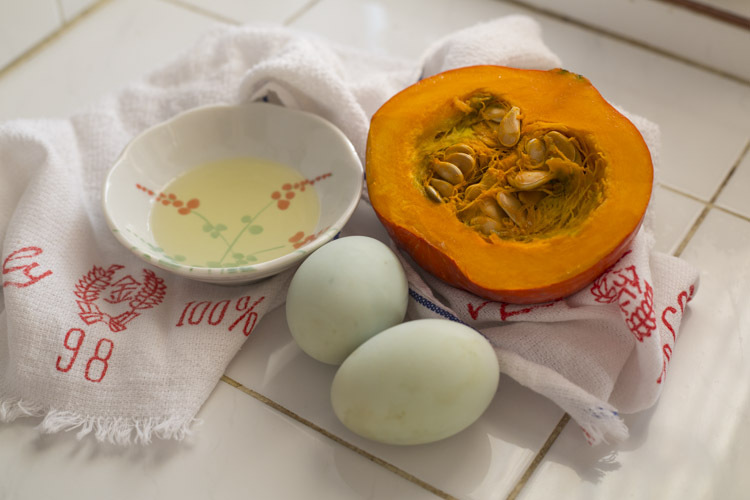 It is possible to make your own salted eggs – if you can wait the requisite 30 days – this great Sichuanese food website has one method, and this cool urban farming blog has another. Let me know how the results turn out! Those eggs sound like they’re right up my alley. I’ll have to look for them at my local market. looks yummm. could try with normal eggs with added salt maybe?